Healdsburg is an attractive town in the heart of California’s wine country. 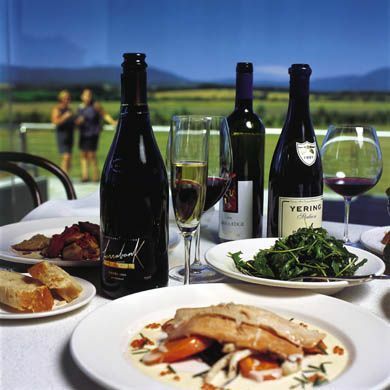 It is therefore justifiably popular with those who need a base from which to visit the wineries of Sonoma and Napa. In such a place you would expect some good restaurants, for those who like their wine tend to be those who demand good food. 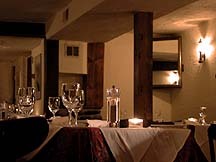 And Healdsburg does, indeed, offer a number of well-regarded dining rooms. Zin is, without doubt, one of the best. (Zin is a reference to the grape, zinfandel.) It is simple, unpretentious, decent and honest. And it is run by those who use their intelligence to serve food and wine which is both excellent value and wonderfully enjoyable. I love grand restaurants, but I also love places like this, which offer joys of a simpler but no less intense kind. The two gentlemen who own this fine establishment are Jeff Mall and Scott Silva. 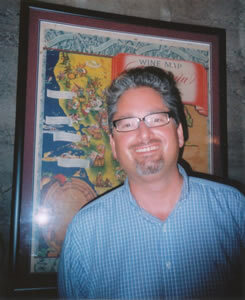 Mr Mall is the Executive Chef and Mr Silva (pictured) deals with the wine and the front of house. It was therefore the latter who greeted me and showed me to my table in the window. I do not know whether the building had a former life, but now it has the air of a converted factory – which means it is spacious, with an open ceiling and beams. Large paintings adorn the walls. At one end of the room (away from the window) is the open kitchen. The tables are without cloths and the napkins are red. The atmosphere on the night I was there – and I think this would normally be the case – was marked by the pleasant buzz of people having a good time. But it was not too noisy and – mirabile dictu! – there was no canned music. All this promised well for an excellent evening. And so did the friendliness of the members of staff in their white shirts. My own waiter, Justin, offered good advice on the wine and ensured that all my requests - a little more of this, a little more of that – were met promptly and efficiently. The motto on the menu reads, “farm fresh at your table” and that pointed to one of the reasons the American food here is so good. For the restaurant has its own farm – Eastside Farm – from which much of the produce arrives as fresh as fresh can be. And not only is the bread baked here, but also the ham, bacon and sausages are produced on the premises. You see what I mean about the intelligent approach? But a talented chef is also required. And that is what Zin has in Jeff Mall. He allows the tastes and textures of his ingredients to speak clearly and directly and has the sense to combine them in ways which interest the palate. My opening tomato salad brought a plate with a trio of offerings: sliced heirloom tomatoes in basil vinaigrette, fried green tomatoes with El Ranchero dressing and warm cherry tomatoes with bacon and frisée. This was a delicious tribute to the tomato. Then I turned to some really good pasta, sweet corn and ricotta (homemade, of course) ravioli with basil butter – the sweet corn adding a lovely texture to the dish. My main course was a handsome smoked pork chop with apple sauce. The smokiness was quite strong for my feeble palate, but Justin was quick to bring more apple sauce to subdue its effect. I finished with a straightforward dish of panna cotta with late summer fruit and almond tuilles. These four courses were $56, which I considered very good value. The wine list is short but well chosen. Most of the wines are local and I would not be at all surprised to learn that Scott Silva personally knows many of the producers. I had the sense that I could have chosen any of the 63 bottles or any of the 20 wines offered by the glass with absolute confidence. Certainly, the bottle prices are friendly, ranging from $20 for a Riesling from Monterey County (Kendall-Jackson Vintner’s Reserve, 2010) to $110 for the 2008 Flanagan cabernet sauvignon from Sonoma County. I began with a glass of bubbly from Anderson County (Roederer Estate Brut - $9.75, glass), which possessed well-balanced acidity. I went on to an impressively big chardonnay of butter and vanilla from the Russian River Valley (Semi Reserve, 2009 - $10.25, glass). Then, as I was at Zin, I thought I should have one of the 18 zinfandels on offer. Waiter Justin recommended a beauty. For just $38, the Gunfighter ’Treborce Vineyard’ 2009 from the Dry Creek Valley yielded an exciting earthiness within the fatness of its ripe black fruit. This was good drinking. Indeed, the whole evening was good. Honest and good. 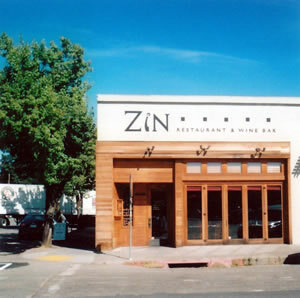 If you go to the attractive town of Healdsburg and want to eat and drink well, you should make your way to Zin. 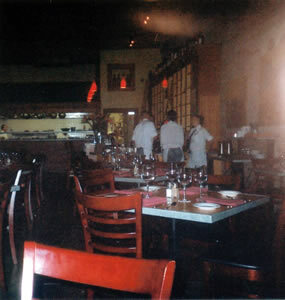 344 Center Street, Healdsburg, California 95448, U.S.A.